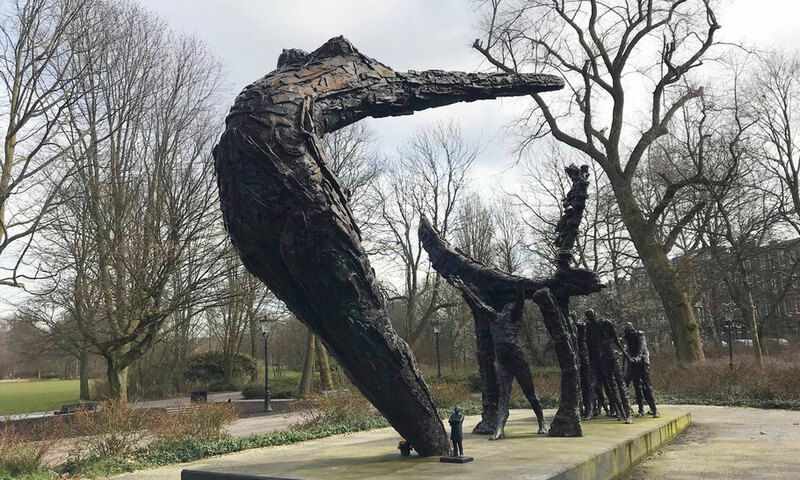 The Nationaal Monument Slavernijverleden (National Monument of Slavery Past), to remember the abolishment of slavery in the Netherlands on July 1, 1863, was unveiled by Queen Beatrix in 2002. Every year on July 1 there's a meeting at the Monument to remember this. The statue was designed by Surinam artist Erwin de Vries, who was also called the Caribbean Rembrandt. He was nominated honorary citizen of Amsterdam in 2009. The monument is located in Oosterpark (Easter Park) in Amsterdam. The revealing event of the monument was a big mistake by the municipality of Amsterdam: only VIP's were allowed, and the people for whom the monument was placed, the Surinam and Antillean descendants from enslaved Africans, had to stay behind the fences.